1) It creates more clutter around my house that will just drive me crazy and make me less productive. 2) Putting those things away is so easy! When I think about how often I don’t do it, it sometimes makes me feel lazy. There are many little things that take virtually seconds to do and can save me so much time down the road if I just DO THEM RIGHT AWAY. And I will argue it can even save me hours because I know first hand just how a mess makes me more unproductive. It also gives me a sense of peace knowing I don’t have any of those small, menial tasks looming over my head. 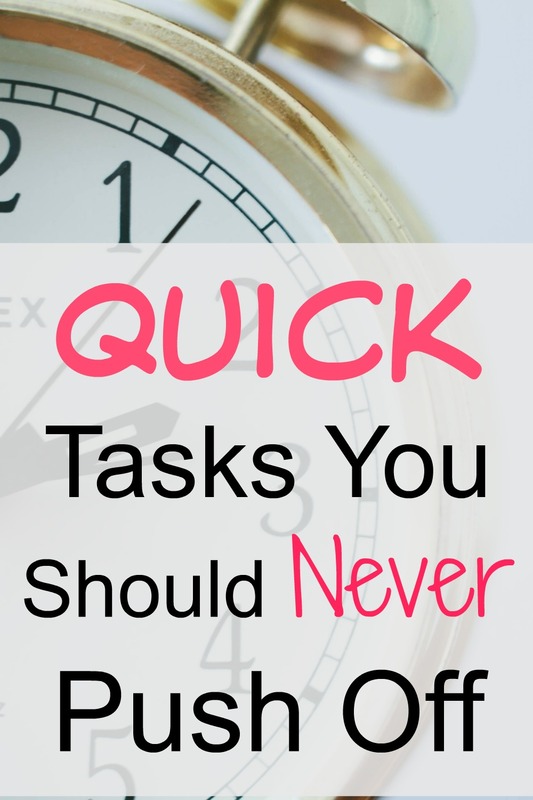 I created a list of tasks that take less than a minute to do and I challenge you to be someone that does them right away and see if it makes a difference for you! I know it has for me! Most likely the closet or coat rack is right by the door. Do yourself a favor and just hang it up right away. Don’t let something like a coat that could so easily be hung up make your house look messy. Unless you keep your hamper in a different room than your bedroom, I assume it is very close to where you change. Instead of putting your clothes on the floor, move the few feet it takes to place them in the hamper. If your laundry basket is not in your room, consider creating a space in your bedroom where you can put them temporarily so they are not taking up room on the floor. As soon as there is garbage, place it in the trash can. Don’t leave it lying around to collect dust, germs, bacteria, etc. How much more time can you save by not having items left off your shopping list? Forgetting something just means running back to the store, time no one has. Plus, why wait until something is gone to get more? Save yourself the headache and already have it on hand when you run out. So often I see (and I am guilty of as well) placing a dirty dish on the counter above the dishwasher. Boy do I feel lazy when I don’t just open the door and put the dish inside! But when I do put my dishes inside right away, this makes cleaning up so much easier and keeps my kitchen counters clean and clutter-free. If you have garbage, shoes, bags from the store, or anything else just lying around in your car, grab it when you get out. You save yourself an extra trip. Sorting through mail can take a few minutes. Instead of having it sit around on your kitchen table in a pile getting bigger and bigger, put it in a special mailbox inside your home until you have a chance to sort through it. Why do so many of us leave the toothpaste sitting on the counter after we brush our teeth? It seems to be one of those things we just don’t like putting away and I’m not sure why. But guess what – it’s very quick and easy to do! Seriously, why does the toilet paper so often end up just sitting on the counter? The holder is right there! Leaving it sit on the counter is asking the next person in the bathroom to put it on the roll for you. Why should they have to do it? Raise your hand if you got married and had many RSVPs not come in by the date – or even come in at all. Sending in an RSVP is also something that many of us wait to do and often forget. Unless you really don’t know whether or not you can attend an event, send in your RSVP immediately. That’s one item you’ll never have to even add to your to do list. All of these tasks are so simple to do and yet can make such a huge impact on keeping your home and mind clean and organized. 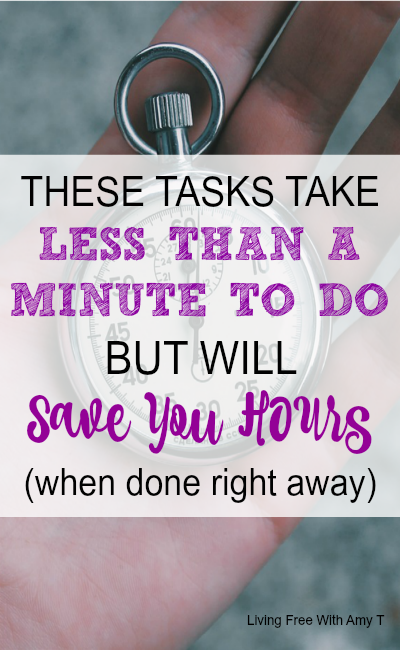 They can also save you time so you can be more productive and focus on more important things in your life! What other tasks would you add to this list that take less than a minute to do?